Fulgurites are unusual pieces of fused sand, stone, soil or dirt, caused when lightning strikes the ground. 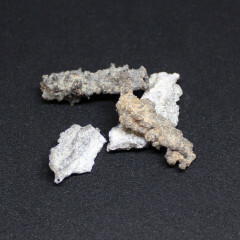 We typically only sell small Fulgurite pieces typically found in deserts. Fulgurite are naturally fused tubes, clumps, or pieces of fused material caused by lightning striking the ground. They are a form of Silica glass, and typically comprise of soil, sand, rocks and other sediment and sometimes, organic matter. So what is a Fulgurite? A form of Silica glass, known as Lechatelierite. They typically form in hollow or branching tubes, as lightning strikes silica-rich minerals usually found in sand, rocks, or soil. Tubular pieces are typically found in beaches and deserts, as a bolt of lightning goes through the sand and melts the silica. The liquid cools quickly, usually forming a tube with a rough outer layer and a smoother inside. Sometimes, the fulgurite occurs underground, and may branch out into root shapes in a similar form to the zig zagging a lightning bolt seems to form in the sky. Typically, these are fragile. They are an impure form of glass, and the walls are quite thin – so they are a relatively brittle specimen. They are also sometimes known as ‘fossilised lightning’, ‘petrified lightning’, ‘Lechatelierite’, ‘fulgarite’, or ‘fulgerites’. Obviously, they do occur in various colours! It all depends on the colours and specific mineral contents of the sand or material where the lightning hit. Fulgurite pieces were featured in the television show ‘Supernatural’, referred to as an “Act of God”. Fulgurite pieces can be found around the world. Most of the pieces we currently sell are from Algeria, the Gobi Desert and the Sahara – but they can be found anywhere lightning may strike. Fulgurite is a glass, so there are inherent hazards with that. If snapped or broken, they can be quite sharp. People believe these pieces are great for healing, as they have an intense electrical energy. They are, essentially, a lightning strike frozen in time! It may help to protect you from electromagnetic radiation, and help with electrical sensitivity. Some people also say can help to regenerate cells, and stimulate healing. They may also be able to channel and direct energy – it should be obvious why this is believed, of course! We would highly recommend indirect method to make your elixirs, either by placing a glass full of stones into your elixir container, or by placing the stones around the outside of your elixir container. Some people suggest using Quartz points alongside these stones in order to amplify and direct the energy into the water. Fulgurites are quite fragile and small pieces can chip off pretty easily – which can be a risk! People believe that Fulgurite can be used with any of the chakras;as it is said to be able to clear blocked chakras. However, many people specifically use them with the heart, throat, or third eye chakras. Fulgurites are typically thought of as being connected with the Gemini and Virgo zodiac signs.